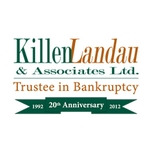 Killen Landau & Associates Toronto is a debt solutions company offering various debt relief programs. The Toronto debt relief experts have helped thousands of people resolve their financial problems and begin a new debt-free life. Richard Killen founded the company in 1992.